Norwich is a very busy and important station with a mixture of intercity trains to London, long distance trains to Cambridge and Liverpool Lime Street, and local trains to Great Yarmouth Lowestoft and Sheringham. Our train, which looks nearly full, leaves on time from platform 4. Norwich station has 6 platforms. We leave the mainline straight away on the right and pass Norwich Crown Point depot, which has a mixture of class 90s, DMUs and a couple of 47s ready to start hauling the Yarmouth drags starting that Saturday. We continue on the Yarmouth branch for a little while passing through some very pleasant countryside, before leaving the branch on the left and start heading north. The ticket inspector comes as we continue through the lovely Norfolk countryside, before we arrive at Salhouse, which seems to be in the middle of nowhere. There is a station building here, but it is boarded up. A couple of people get off. After leaving Salhouse, we speed up to around 50-60 mph passing through the very picturesque Norfolk Broads, before arriving at Hoveton and Wroxham. This is the capital of the Broads, with lots of boats and tourists enjoying the nice weather. The station itself, has its buildings boarded up and has a restaurant on the Sheringham platform. Next to the station is the terminus for the narrow gauge Bure Valley Railway, which runs to Aylshan. A few people get off and about the same get on. After leaving Hoveton and Wroxham, the track becomes single as we continue through the countryside, speeding through Worsted station without stopping. The station building is boarded up. There are a couple of people waiting for the return train to Norwich. We continue to North Walsham where the train stops and a few people get off and on. On the opposite platform there are about a dozen people waiting for the southbound train which arrives as we depart. Next to the station is a gas terminal which has occasional freight trains to Harwich. 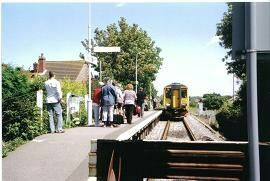 We leave the town and go back into the countryside passing a few houses before arriving at Gunton, which has a single platform and shelter, but on the disused platform the station has been preserved in GER colours and has a steam train in the garden. About 5 people get off which is quite surprising as the station is in the middle of nowhere. The car park has four cars in it and that looks like that's all it can hold. The scenery becomes hillier as we reach the outskirts of Cromer and pass Roughton Road station without stopping. The station is a simple platform with a bus stop shelter. Just before Roughton Road the old GER line to Cromer branched off and headed into Cromer through the Cromer tunnel which can still be seen not far away if you get off here. We then meet up with the old Midland and Great Northern Joint Railway as the track becomes double as we approach Cromer with its now disused signal box, which is now a museum, with a miniature railway in the grounds. The station has two platforms with simple shelters. The goods site is now a Homebase. As Cromer is a terminus, the driver has to change ends. It only takes a couple of minutes. Most of the passengers get off and there are now only a handful of people onboard. We reverse from Cromer leaving the Norwich line on the left and heading straight passing the sea on the right, as we stop at West Runton. Apart from Cromer, this is the only Midland and Great Northern Joint station left. The station has a simple shelter, but has plenty of flowers and is well looked after by volunteers. We then continue for a few minutes along the coast, before arriving into Sheringham, which now only has a simple platform and shelter. The original station which is across the road is now used by the preserved North Norfolk Railway, which runs to Holt. The two stations are now joined by a level crossing which allows occasional through trains. A few people get off and quite a few get on and after a couple of minutes turn around, we depart for Norwich on time. Summary: A very pleasant branch line through some very nice countryside, which provides a vital link for these communities and is popular with holiday makers and tourists plus people who work in Norwich.